The Parker Frontier was released in 1996 featuring a nice mix of classic design and modern technology. 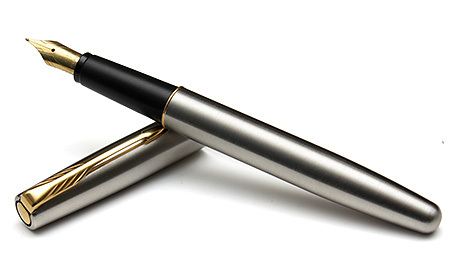 The main body of the pen has a nice thickness to it set off by the smooth rounded end and a etched gold plated steel nib. The cap features a modern stylised arrow and a rounded clip end whilst the shell section is made of ABS moulded plastic. Identified by the rounded tail end and the stylised arrow clip with the rounded top. Various colours and designs including translucent coloured barrels as well as multi-coloured, two tone marbled and of course steel Flighters in gold trim and chrome trim. 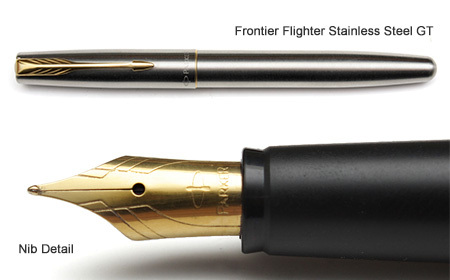 Possibly the most desirable Frontiers are the ones which have the dark Diamonite Z (a mixture of Gold And Titanium) plated cap, nibs and trims. 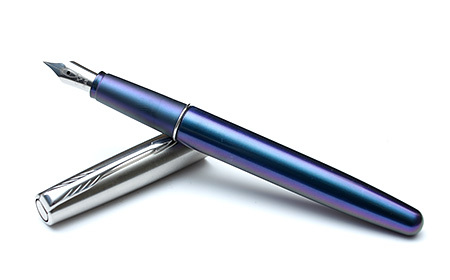 The Parker Frontier was sold as a mid range pen, somewhere between the Sonnet and the Vector. It was finally discontinued in 2012.